Radical Truth Activist Julian Assange has been granted political asylum from Ecuador, leading to a standoff between the South American country and the United Kingdom (who wish to deport Assange, allowing him to face political persecution). The following is an article from The New York Times, giving an update on the current situation. We claim no ownership over this article; it is being posted purely for educational purposes. CARACAS, Venezuela — Ecuador forcefully rejected pressure from Britain and announced Thursday that it was granting political asylum to Julian Assange, the founder of WikiLeaks, who has been holed up for two months in the Ecuadorean Embassy in London trying to avoid extradition to Sweden. The decision, citing the possibility that Mr. Assange could face “political persecution” or be sent to the United States to face the death penalty, escalated the unusually sharp strains between Ecuador and Britain, and drew an angry rebuttal from Sweden. The Ecuadorean move protects Mr. Assange from British arrest, but only on Ecuadorean territory, leaving him vulnerable if he tries to leave the embassy to head to an airport or train station. Ecuador’s foreign minister, Ricardo Patiño, made the announcement at a news conference in the Ecuadorean capital, Quito. “The government of Ecuador, faithful to its tradition of protecting those who seek refuge in its territory or in its diplomatic missions, has decided to grant diplomatic asylum to Julian Assange,” he said, reading from a government communiqué. He added, “There are indications to presume that there could be political persecution,” and said Mr. Assange would not get a fair trial in the United States and could face the death penalty there. Mr. Patiño said he hoped that Britain would permit Mr. Assange to leave the embassy for Ecuador. But at a news conference on Thursday in London, the British foreign secretary, William Hague, repeated the government’s stance that Britain was legally bound to to extradite Mr. Assange to Sweden, where he is wanted for questioning over accusations that he sexually assaulted two women. The president of the National Assembly of Ecuador called a special session for Thursday evening to discuss the perceived threat against the embassy by the British government. A spokesman for Sweden’s Foreign Ministry, Anders Jorle, said the country’s legal system had been impugned and the Ecuadorean ambassador had been summoned. In Sweden, Claes Borgstrom, the lawyer representing the two women who have accused Mr. Assange of sexual abuses, told the online newspaper Expressen.se that the women had expected the decision but still thought it absurd and were disappointed. 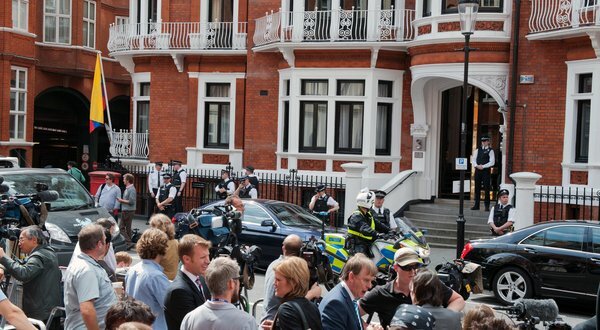 Outside the embassy, a small red brick apartment block behind Harrods department store in the upscale Knightsbridge neighborhood, a protester with a megaphone provided sporadic updates on the progress of the news conference in Quito. When it became clear that Mr. Assange had won asylum, the response was a muted joy. “It’s great news,” said a youth worker, 21, who gave his name only as James. “As long as Britain honors his right to asylum,” he added, outlining his hope that the British government would allow Mr. Assange to leave the country without arresting him. If that does not happen, he said, gesturing to the protesters around him, “this will only get bigger.” Like many of the protesters, the youth worker said he believed that the accusations of sexual abuse against Mr. Assage were part of a conspiracy to silence WikiLeaks. “Textbook character assassination,” he said. Speculation immediately turned to whether, and how, Mr. Assange might seek to escape. Mr. Patiño said his government had made its decision after the authorities in Britain, Sweden and the United States refused to give guarantees that if Mr. Assange were extradited to Sweden, he would not then be sent on to the United States to face other charges. Those close to Mr. Assange have said that he fears ending up in the United States, which could bring charges over WikiLeaks’s release in 2010 of thousands of secret documents and diplomatic cables relating to the wars in Iraq and Afghanistan, as well as to American relations with other governments. Mr. Jorle, the Swedish Foreign Ministry spokesman, said there had been no request from the United States for custody of Mr. Assange. Some analysts said that Ecuador had entered a high-stakes game on Mr. Assange’s behalf. Mauricio Gándara, a former ambassador for Ecuador in London, warned that by granting him asylum, Ecuador risked jeopardizing trade ties with England and other European Union countries. In 2011 about 28 percent of Ecuador’s nonpetroleum exports went to the European Union, according to government data. Nonpetroleum exports to the United Kingdom were $139 million last year. He said that he was not aware of any previous dispute of similar magnitude between the two countries. The WikiLeaks founder sleeps on an air mattress in a small office that has been converted to a bedroom, according to accounts of those who have visited him. He has access to a computer and continues to oversee WikiLeaks, his lieutenants have said. Reporters outside the building have seen food being delivered from nearby restaurants. His presence is a challenge for employees of the embassy. One British government official, citing a conversation with a member of the embassy staff, said the situation was surreal. A diplomat familiar with Mr. Assange’s situation said he spent his time in a back room, which gets no direct sunlight. Several weeks ago he had a bad cold and appeared depressed, the source said. She said some of Mr. Assange’s friends have encouraged him to play music and dance as a way of getting physical activity and had also brought sunlamps. Although WikiLeaks has shrunk substantially during the 20 months of Mr. Assange’s legal battle in Britain, losing many of its most skilled computer experts along with several of Mr. Assange’s closest associates in building the organization, it continues to issue statements about his plight. On Thursday, ahead of the Ecuadorean decision, it issued a new, unsigned statement describing Britain’s warning that it might suspend the embassy’s immunity as part of an action to arrest Mr. Assange as a “resort to intimidation” and a breach of the Vienna Convention governing diplomatic relations between states. It struck many as odd that Mr. Assange, who shot to fame as a fighter for media freedom, chose Ecuador as a potential refuge. Mr. Correa has presided over a crackdown on journalists there. But when Mr. Assange arrived at the embassy, he issued a statement saying that Mr. Correa had invited him to seek asylum in Ecuador during an interview for Mr. Assange’s TV show on Russia Today, an English-language cable channel financed by the government of Vladimir V. Putin. The author of this blog stands together with Julian Assange against these bogus “sexual abuse charges” and political persecution. Long live Freedom of Speech and Truth!